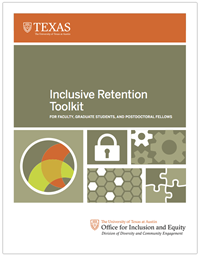 The Inclusive Retention Toolkit for Faculty, Graduate Students, and Postdoctoral Fellows is a comprehensive toolkit compiled by the Office for Inclusion and Equity (OIE) in the Division of Diversity and Community Engagement at The University of Texas at Austin (UT Austin). The toolkit provides strategies and ideas drawn from best practices for retention from across UT Austin, comparable institutions with NSF ADVANCE grants, and relevant research literature. Suggestions and practical examples are provided for areas of retention including climate and culture, leadership development, opportunities for professional development, and mentoring. In addition, references and additional resources used to compile the toolkit are included. Provide transparent information for faculty, graduate students, and postdoctoral fellows on relevant policies, procedures, practices, and resources through an accessible and comprehensive departmental website including critical information on promotion and tenure, dual career assistance, family friendly policies, disability accommodations, etc.